I used to live up Waterbeer Street and I used to live in a court called Snells Buildings, which van parallel with Parliament Street, which is the smallest street in the world. In Parliament Street itself when I was a schoolboy, ever since I could flick marbles I suppose, I'd spend hours and hours in that lane flicking marbles with my school friends. Not like they do now; you flipped them and they landed wherever you wanted them to, if you are clever enough. "Where's my glassy marble gone?" The glassy marble used to come out of the ginger beer bottles which we used to get when I was a boy from the Yacht Beverage in North Street. I smashed many a bottle to get the marble out. The Yacht Beverage is where the Gaumont Cinema is. What you got in the Yacht Beverage there was nothing but a mass of glass bottles and marbles everywhere. You'd go in there and get a pennyworth of lemonade and you drink it till you bust. When the bottles were filled the marble would float up to the top. I've got the thing we used to open the bottle with: you'd put that one on top and push it down to release the marble and once that was released it wouldn't come up again until they filled the bottle. Wash them out and refilled. My childhood was spent in Waterbeer street. Mind you I had to work. 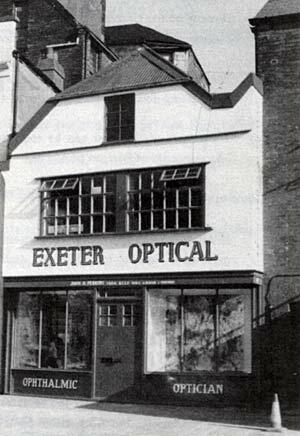 I worked for a grocery provision merchant down North Street called Wilcox. And that shop is where the typewriter shop Southwards is now. Now I worked there, when I finished school for the day; I was 11 years old. My father got me a brown document that I was allowed to work between school hours. You got to have this otherwise it was a illegal : they thought perhaps you was having child labour. I used to work there when I came out of school dinner time for half an hour. After school I had to work till 7 o'clock. And I walked miles delivering groceries for people better off than my mother and father. I carried a basket about five times the normal size. When I walked along it was that full I was half bent sideways it was so heavy: all up Union Road with it for the princely sum of half a crown all week. And I used to take that home to my mother wish I had two – that was orders. What Father said then, he said and he meant: there was no arguing about it. Out of a half crown they used to give me 2d and I used to buy four gob stoppers that used to last me nearly a week. After I had left school I worked for Mr Wilcox and he gave me a rise of half a crown which was five bob a week. I work three times as hard then. He used to have a pony and a trap, a lovely grey horse , sort of dapple grey like. And every Friday he used to say to me, "go over and harness the horse, put him in the trap. You're going down the Ice House, down by the Bonhay Road." "Yes, sir." You had to say sir to these people. I'd go over and get the horse and he'd come over and say, "Right then; it's half past four; I want you back at half past five, no later." I used to have to take the horse myself, go down under the Ironbridge; the can't now but you could then; Down Exe Street and turn into the Old Ice House, the remnants of which are still there now. I used to go in and ask for Mr Wilcox brass balls – that was the sort of thing they fed to pigs; they come from a cow, the innards of a cow. And he used to order one of these every week. And I had to take it from the Ice House out to Cowley Road where he had a little smallholding, dump it there, bring the horse back; clean the horse, clean the cart and then go out on my deliveries after that. These memories are taken from the contribution by Mr F G Lendon to the People Talking project that was created by Jenny Lloyd in 1976. The full transcript, and other People Talking memories are available at the West Country Studies Library or the Devon and Exeter Institution. No. 14 Waterbeer Street was Munk's Ironmongery in the 1920s.